With the election of a new Government, it is highly likely we will see Light Rail from the City to the Airport via Dominion Rd and the Southwest built within the next decade. This was not only a campaign policy of the Labour party but a major part of the confidence and supply agreement between the Labour Party and the Greens. It is also likely that the East-West link as proposed by the previous Government will not go ahead, instead being replaced with a more fit for purpose corridor upgrade. This presents an opportunity to have a little re-think of the Light Rail’s alignment. Currently, the plan is for light rail to pass over the top of the Onehunga train station and Neilson St, now that the rail bridge has been removed. It will then follow the old rail corridor for a short distance before crossing over the Manukau harbour and passing underneath the existing motorway bridge as seen below. Panuku is currently working on a plan of urban regeneration through a project called Transform Onehunga, which was covered by Matt here. This exciting project was hugely undermined by the now cancelled version of East West Link. 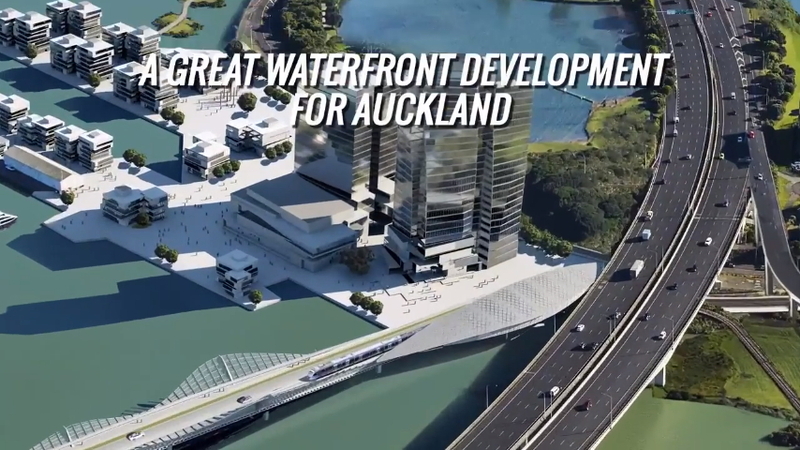 One of the major parts of the plan was the redevelopment of Onehunga Wharf post-2023 into a mixed-use waterfront precinct, the Wynyard Quarter for the Manukau Harbour. At the same time, discussions are happening over the replacement of the over Old Mangere Bridge now over 100 years old. While a new pedestrian and cycling bridge has been consented, it was put on hold due to East West Link. More about the design can be seen from this Bike Auckland post. The new alignment would also create the ability for a better-placed station further west, much closer to Mangere Bridge Town Centre. This would be a much better catchment than just by the motorway. All in all, realigning the Manukau Harbour crossing could have many positive benefits especially enabling a fantastic opportunity of transforming the Onehunga waterfront. What about the seals? I was under the impression that the mangroves and foreshore near KiwiRail were rather popular with our local Arctocephalus forsteri / NZ Fur Seal / Kekeno. The harbour is also very important for several migratory birds, such as the Bar-tailed Godwit, Turnstones and large numbers of South Island Pied Oystercatchers. Also the Ambury side is very important for the threatened New Zealand Dotterel. That the harbour is polluted is a testimony to how we’ve abused the harbour, to simply give up and remove vital nesting and recuperation grounds rather than attempting to resolve the issue is a concept that leaves me speechless. +1! Very significant area for many bird species. No need for huge reclamation of land in this area. You could maybe do some sort of canal/island/inlet type arrangement. Keep the existing edge and mangroves as a sort of canal around the outside and fill parts of the middle, effectively creating more edge and mangrove areas. 3) is the cost representative of money well spent. New Zealand has many examples of changes made, sometimes ostensibly to assist nature, where the changes have made things worse for the local ecology or erosion. Yes I’ve got no idea the impacts on the water and ecology, presumably pretty extreme… although maybe better than the current state? As an aside what is your view of the new Ohenunga foreshore works along the motorway? I’m pretty sure 3 would be true, you could create about 300 hectares of centrally located waterside land worth around a billion dollars. The current extreme is due to either treated “freshwater” being dumped by the waste treatment plant. Or storm induced sewer overflows from this plant and the sewer/stormwater pipes overflow into the harbour. Money is better spent fixing this. Not some pie in the sky land reclamation program. A reclamation programme wouldn’t be either pie in the sky (we reclaim land all the time), nor money spent. It would make money given it would create around a billion dollars worth of land. I wonder if you could use some spoil from things like the CRL to create an artificial rowing lake along the northern shore. Given how popular the sport is and how successful we’ve been in the Olympics in recent years it could be a great asset to the city. Interesting idea. I can’t see it happening though, due to Lake Pupuke and the council’s desire to avoid replicating functionality. I’ve long advocated for this. It is an unused piece of harbour that is in a prime location close to the city centre and with good transport links. As residential it could support tens of thousands of people or as mixed it could provide much needed land for business. I’m sure with that sort of money from the sale of the land they could build a really nice area for the seals and any other affected sealife (and have a lot of leftover money for council to use for other projects – infrastructure etc). Mangroves are everywhere nothing special about them in a polluted area. Developing the Mangere Inlet would also help preserve other areas from urban sprawl (especially considering it would be developed as medium-high density). The Manukau Harbour is huge and the Mangere Inlet would not be missed. That aside, in the meantime the above proposal to combine the replacement bridge with LRT does make a lot of sense to save money. I can’t agree with you on this. You can’t just destroy nesting and feeding grounds and expect the birds to recover. Considering the conservation status of (say) Godwits, any reclamation move is far from green. This is of course ignoring two big road blocks: The cost of reclamation would be amazeballs high. Any reclamation would need to be pretty high (above mean sea level) to account for projected sea level raises. Any reclamation would need to be pretty high (above mean sea level) to account for projected sea level raises. Reclamation would be expensive but it would also create even more expensive land. As someone else mentioned the net gain would probably be around a billion. Also being so far into the harbour it wouldn’t need to be that high (since harbours don’t get as high as the surrounding sea due to the slow flows caused by the harbour entrance. Yes a canal type project could be quite cool but overall fill in most of the inlet to make highly valuable land in a great central location. I agree. The upper Manukau Harbour is just an unslightly stinking muddy mess becoming rapidly engulfed in Mangroves. It will soon just be one big mass of Mangroves. I recall hearing that during World War 2 while the American serviceman were here, they proposed bulldozing Mangere Mountain into the Upper Manukau Harbour to reclaim it. Serious consideration should be made to reclaiming at least part of the upper harbour with just retaining a canal through the middle of it. Good ideas here in the article and comments…future proofing for global warming means allowing at least 2m of sea level rise by 2100. IPCC estimate min is at least 1m with 1.5-2m being more likely range allowing for current global emissions/ our slow response to the threats.. So any rail line and stations ned to have this allowance also Onehunga wharf structures. Left field idea but one already being used overseas (e.g. Holland) now is floating structures – floating houses and commercial development. Manukau harbour would be ideal for this and with enough public spaces would be an interesting development. At the moment Mangere Bridge residents pretty much have to use their cars to access isthmus Onehunga. A station close to the Mangere Bridge shops could tap this catchment and give residents an opportunity to leave their cars at home. Hopefully less use of the motorway and the need to find an all day park at their place of employment? how would that work on the south side? What about taking the tracks further down Coronation and back to the motorway via what looks like industrial land with no buildings just past Hocken Place? The same catchment argument for Royal Oak could be applied here as well. Down Coronation Rd to Bader Dr. Connecting to the current LRT current at Mangere. Some consideration for land use changes could also be made based off that. I see the concept drawing has the walkway/cycleway beside the light rail tracks: I think It would be better to put the walkway/cycleway on top. That way the active modes have unobstructed views in both directions- it would be like a pier crossing the Manukau. There’s a structural benefit too- the deck of the walkway forms the top of a beam supporting the train deck. I’ve been thinking that most of Auckland’s rail lines should have a deck path along the top, for cyclists, walkers and joggers. It would be a good way to create active highways. Also they wouldn’t have to be engineered to have the tolerance of roads. The views would be great as would the benefits from connectivity. Does seem like a very good idea. I like the redeveloped wharf graphic too. I’ve been pushing for this idea as it seems entirely logically and particularly I think helps solve the long standing issues that Mangere Bridge residents feel with the severance from OnNehunga by SH20. One other aspects I think is worth considering is turning the LRT station in Onehunga over the HRT is a public space. Not just a viaduct, but a complete structure with the HRT underneath. Definitely needs a suitable interchange between HRT, LRT and buses. Some like the new Széll Kálmán tér would be great. In principle I think this is a good idea. The EW link spaghetti at Onehunga would have affected (limited) LRT bridge alignment options, so it is back on the table now. You do not want the LRT to wander around too much or travel time to the airport will be affected. But a new combined bridge should be possible, cheaper than two, and allow a reasonable travel time if there are no sharp bends. Likewise running along Coronation down to the SH20 interchange roundabout should allow good local access. Presumably another reason for LR via Onehunga over HR for the airport link. Or at least, the first one. A much better use of the space than a motorway interchange. I’d also agree that combining bridges is a good idea to save money and avoid cluttering the harbour. If there were an Onehunga Wharf LRT station, to keep good station spacing, where does the HR and bus interchange end up being? I’d think the existing HR station would be too close being only 700-800m away. Ideally there would be a compact HR / LRT / bus interchange, either on 3 levels, or two with LRT platforms beside HR. Does it make more sense to have this at Mangere Bridge, assuming connecting buses from further south? Yes surely the current P&R area is a waste and the space used with some more as a bus interchange. The current location seems wrong. You still need the LRT station in Onehunga at self. Most of the commuters are in Onehunga. A port station would be for people coming from outside the area. Then a Mangere Bridge township station. It might seem too close spacing, but the stations would serve different purposes. The current bus station next to the library in Onehunga would stay. It’s not that far to walk. Or you could have buses feed though the train station, but stop at the library bus station. There is the bus depot on Neilson St. I wonder how far the council is with the design for replacing the old bridge with a new pedestrian bridge. Quite a lot of money has being spent on the boat ramp on the Mangere Bridge side as well. It would be a waste if that had to be rebuilt. I am not convinced of the necessity for the light rail to the airport if it was up to me I would just extend the single track heavy line across the harbour to Mangere bridge and Mangere town center. If a half hour service to the CDB wasn’t good enough then a couple of passing loops could be added along the line. The other possibility now that the East West link is to be redone would be to run a rail line along the foreshore from just before the junction at Westfield station which would join up with the Onehunga line before crossing to Mangere bridge.We could reconfigure the freight lines which run to the Southdown terminal to connect to the southern mainline.We could even have a new Southdown station at the end of Hugo Johnston drive. You can still build the light rail to Onehunga or better still to Onehunga wharf if you must.The other possibility would be to convert the existing Onehunga branch line to light rail so the terminal of the line would become Penrose station. And the Mangere branch would start at Southdown station. 3. The Airport – Ascot employment area is one of the biggest and fastest growing in the country. Royce, I think if you look at both the SH20 corridor width, and OBL reservation width, the ability to get passing loops on the LRT, or double track on the rail lines, is quite limited around here. Wasn’t that all covered in the airport rail study? Consent was issued. So the design was done. I’ve seen the RC decision and I’m requesting copies of the consents/designs/etc. Obviously this design will have to be redone if the LRT goes over the bridge. Think that the Onehunga Harbour bridge (SH20) carries about the same amount of traffic at the Auckland Harbour bridge (AHB). But the AHB has 50% of it’s traffic in PT. The Onehunga harbour corridor needs the same high volume PT option. LRT is the best way to do this right. Not quite the same. Harbour bridge is 171,000, Onehunga is 126,000. AHB does not have 50% of it’s traffic on PT. That would be 62 million PT trips. The total for Auckland is under 100 million. The AHB has 50% of people on PT in the peak hour and 50% of traffic to the CBD on PT. Agree that both should have a rapid transit option. LRT is right for both, but more urgent at Onehunga. Thanks for clarifying. Peak is important though, as that is when the congestion is at it’s worse. Large part of the discussion around the EWL (*) was that the Onehunga traffic volumes were being projected to exceed the AHB. Without the alternative of rapid PT though that corridor then it would all (99%) be car traffic. (*) Note: the EWL wasn’t a solution to that IMO. Actually would have made things worse. Good point, I imagine the peak might be peakier there. There are as many lanes too. Worse, the on and off lanes don’t have enough space. We have Neilson St southbound being three lanes with trucks+cars merging into one lane up a steep grade. Both the Onehunga Mall northbound on-ramp and off-ramp causes slower traffic over the bridge. Especially the short merge after the off-ramp. On bad days, the trail from SH1/SH20 in Manukau is now at Mangere Bridge. If that gets worse and starts going over the bridge and up the hill. You can imagine how painful that will be. I thin that speaks to part of the problem with modelling these systems. Congestion destroys independence assumptions. When short distance trips can not be completely due to long distance trips. Then any modelling breaks down. Light rail – It was the policy of the Labour party before the election only because they had no real policy…. so they adopted what was proposed here on Greater Auckland, copied it 1:1 and announced it as theirs. Now the reality bites… I’m worried nothing will actually happen in 2018, 2019, only announcements towards the end of their term, so they can nicely wash their hands. Sad ! NZ First had a good policy during the election to build a heavy rail line from Wiri to the airport initially, which would enable a Manukau-Airport service to operate, connecting with existing Eastern Line services. The heavy rail line would then be later extended north alongside the motorway to join with the Onehunga Line. The heavy rail option makes more sense to the airport, as it would serve all the same communities as light rail would south of the Mangere Bridge – but could also be used as a new route for new long distance inter-regional services in and out of Auckland to the south to Hamilton and the Bay of Plenty running via Auckland Airport. Heavy rail could also be used for carrying freight. As Auckland’s roads continue to become increasingly congested, particularly those leading to the airport, and with the large amount of distribution centres developing around the Airport Oaks area, a railfreight terminal could be established in this area. Fuel supply security to Auckland could also be provided by heavy rail to the airport where a siding could be built into the Wiri Oil Services terminal at Wiri from the proposed Wiri-airport line, with the potential for fuel to be transported by rail to this terminal and the airport using the new line to be built to Marsden Point where the refinery is, and the soon to be upgraded North Auckland Line. The Airport have ruled out building a HRT station. So that option is not practical. How will the extra station at the wharf affect travels times to the airport vs the heavy rail option. I can see light rail speed being whittled down by extra stops here and there that all make great sense for extra catchment on their own. It would add about a minute. Depends on what the purpose for this line. Catchment vs travel time to the airport. Ben Ross has talked to this point with his comments about the southern route via Punihui being better for travel time CBD to Airport. In fact in the short term, RFPs have been issued for the Southern BRT or LRT route. So it will likely be the fastest route even before the LRT build gets started. If it was a line to service CBD-Airport trips. Its not. Its a SW transit line, which happens to have the CBD at one end and the airport at the other. It will provide 4 new stations in a massive catchment area currently starved of any RTN. The Puhinui option adds none (aside from the airport itself). People going Airport to CBD (and return) will be a small number of trips overall. I talk about this as additional. Rather than one trumping the other. The catchment aspects of the SW line are in someways more important that the travel time from CBD to airport. But there is the politics and optics. So the stakeholders and how they can sell the deal to the uninformed is important. So the travel time number will constantly come up. Think you might have missed the point. 1) the SAL intersects the Southern and Eastern Lines at Puhinui allowing those who can access the line (including those off the Northern Busway at Britomart). Papakura to the Airport would become 35mins including transfer. 2) The SAL intersects Manukau Bus Station which is the core bus station servicing South Auckland allowing those busses to feed into the SAL at Manukau. 4) Finally the SAL runs out to Botany and possibly Howick intersecting with those who work at the Airport from there. As Nicholas Lee said it depends on catchment vs speed to the Airport. As I understand with the information out there the Northern Airport Line (Airport to City Centre) was designed around maximum catchment serving an area currently devoid of Rapid Transit of the heavy rail lines. The Southern Airport Line (Airport to Botany via Puhinui and Manukau Stations) is about catchment and time to the Airport. Filling in harbour to build houses is an ill thought out kneejerk reaction to the result of poor policy and absent planning. The word ‘reclaiming’ is a misuse. It is ‘claiming’ that is being suggested. The precious Manukau has been slowly nurtured back to health and should be left alone for the sake of the huge numbers of migratory birds that rely on it. The root causes of our housing and pollution issues are unfettered immigration and short term profit-making at the expense of a sustainable long term vision. New Zealand has an opportunity to preserve what is precious instead of destroying everthing around us like the ‘developed’ nations that envy our environment and lifestyle have. We must look at the world around us and learn how we have got it so wrong in the past. Mimicking other nations’ folly is lunacy. I attended an AT-NZTA meeting with assorted politicians about six years ago where the finished concept (!) for the pedestrian bridge replacement was being discussed. I asked what to me was the obvious question: why build a separate high-level crossing for (then-proposed) heavy rail; why not incorporate it into this new low-level bridge? Surely much cheaper? The answer given then by NZTA was that to do so would compromise water access to the upper reaches of the inlet unless a lifting bridge was built – this would be horrendously expensive and would also compromise the train timetable with all that constant opening and closing of the bridge. Presumably to serve the throngs of commercial vessels that are busy running freight to and from the industries along the harbour edge. If that was really the logic then it was an excuse rather than a reason. Why NZTA should take this approach was beyond me unless it was a defence against ANY harbour rail crossing (answering my own question here!). No question – a low-level crossing would save gazillions of dollars compared to a high-level crossing and to combine it with a project that is already proposed is a no-brainer. Agree, a low level rail bridge under the high level motorway bridge makes sense. Never ever seen any boats in the Upper Manukau Harbour towards Westfield, which is just a stinking muddy mess, rapidly becoming engulfed in Mangroves. Boats can’t get under the existing (old) bridge. So it’s logically you don’t see any. That doesn’t imply that new bridges should also be low. Love the idea Harriet, no reservations. It’s a vital nexus to get right, and the Minister needs both housing and transport outcomes in a very tight piece of land. Wouldn’t let Auckland Council near it or it will never happen. Looks more like a job for a state Urban Development Agency, so that the required land swaps and integrated transport construction can be done through central government arms. Go and make a time with Minister Twyford and put it to him. (1) Could/should the LR crossing of the harbour be via a low-level bridge with cycle and pedestrian access also provided? Absolutely, yes, it’s a no-brainer. (2) Could/should the Mangere Inlet be filled in and used for housing and other urban purposes? Absolutely no: we learn to our peril that tinkering like this with the natural environment usually proves disastrous. I’m no expert, but what I’ve read here about the probable impact on seals and birds (and possibly other wildlife) fills me with concern. Mangroves in particular seem to get a bad press, but they’re an important part of the natural ecosystem. One reason they’re expanding and colonising new areas is because we have stupidly tolerated sediment build-up in the Manukau (and upper reaches of the Waitemata) caused by poor land use policies.The solution to this environmental problem is not to create a whole raft of new environmental problems. Light rail to the airport will only benefit tourists to Auckland. It will not take congestion off our roads. Wilhelm Wolfaardt, you don’t seem to have been paying attention: the airport and surrounding businesses are a significant employment zone, and the light rail line would also pass through some large suburbs. It’s NOT simply “trains to planes” – it’s about network connectivity for a currently underserved area of the city. Do try to keep up! It is not really about the airport travellers. It is about the South-Western suburbs of Auckland (Mangere especially) which would be served by this rail line as well as the massive employment zone at Airport Oaks which employs thousands of people; as well as the airport travellers themselves. At the time that the Onehunga line was rebuilt I posted on the better transport website that the line should be rebuilt right down to the wharf with a station at the wharf so passengers from Mangere bridge could walk across the old bridge to catch the train to town or where ever. My ideas were POO Pooed by forum members.. But think how much of a better position we would be in today if it had being done. The overbridge on Neilson street would still be in place and the plans for the East West link would have being made so much more difficult and a new bridge could now be built to replace the old one which is exactly what has being suggested in this piece. The lesson which should be taken from this is to never ever destroy any rail infrastructure.Rail was on the foreshore first it should never have being allowed to be abandoned. I also blame the present cockup on the design of the first new bridge the one that caused all the strikes in the 1980’s. This should never have being a high level bridge imagine how much easier the road layout would have being if it had being built at the same level as the old bridge. It must seem like a major expedition to get in your car at Mangere bridge to go to the shops in Onehunga I know it is on the bus.and I don’t even have to worry about driving. Sometimes its just easier to walk. Must be getting old I suppose. In retrospect I think lowing the Neilson St bridge was the right thing to do. Trucks now don’t have to gun their engines up that grade = less pollution. Traffic is flowing better. There maybe better was for that junction to work – like trenching, tunnels or something. But as a short term fix, it wasn’t all that bad. HRT was never going to cross the harbour, given other dynamics. So the value of it going to the port is very limited. The LRT option over the top of Neilson St is very workable. Especially the added value of the LRT route going though Mangere Bridge township. This creates a very good connection between Onehunga and Mangere Bridge. Lots of community benefits just for that. That reminds me of the brush off when I suggested it back in the day. However I am sticking to my opinions I don’t care wether traffic is flowing better the whole area is a roading cockup and the rail and the cycleway are the only good part of it. I am glad the east west link is gone and a heavy or light rail link across the harbour with pedestrian and cycling access can’t come soon enough for the people of Mangere. Rather than waiting for the light rail to crawl its way from Britormart to Onehunga and then across the bridge it would be better to build the section from Mangere town center to Onehunga Station first if passengers need to change modes at Onehunga then okay however I just think it would be easier to build it as heavy rail. It does not need to connect to the airport. The bus from Papatoetoe or Puhinui if you must, is perfectly adequte. Actually a bus from Mangere town center would be okay too if the rail ran to there. Heavy rail wouldn’t be easier, the business cases demonstrated that. Also, why on earth would you stop the rail line at Mangere, 5 km short of 40,000 jobs in the airport precinct!? I’m concerned about the Mangere Bridge and Onehunga connection as well. However HRT doesn’t add any value to that. If HRT was to cross the harbour it would 1. require a lot more houses to be removed for the route; 2. not go as close as LRT can go. If the HRT stopped on the Onehunga side of the harbour it would restrict alternatives that would go though that corridor and further south. As LRT is on existing roads, it can be built faster. So Mangere Bridge potentially gets a station in the center of the township which connects it to the CBD, Dominion Rd, Airport and Manukau. Plus you can still connect to the HRT in Onehunga or Manukau. So more coverage. The railway line goes to Onehunga the light rail doesn’t exist. Which could be built first. It doesn’t have to stop at Mangere Town center but it would be a start. A HRT crossing over the harbour doesn’t exist either. Whereas the Old Mangere Bridge is a crossing the LRT can use. So it’s pretty much equal on your statement. In fact, a third crossing (for HRT) would be much harder to get built – especially with the LRT option now in the national policy settings.